This Lovely, 1 ACRE Waterfront Duplex Apartment is located in the Private Community of 'Bayhaven' and offers exclusive use of the grounds, decks and private Pool . Visitors enjoy Tranquil and Perfect Summer and Beach Living as it is situated directly on the North Pond Natural Reserve. This Waterfront private paradise offers Heron, Egret, Deer, Rabbit, Fox, Ducks, Geese and Swan that can be seen daily. The pond gives out to the Peconic Bay and the community's Private sand, shell and rock Beach. The home is peaceful and quiet while remaining a short bike ride or leisurely walk into the charming village of Sag Harbor for restaurants, shopping, marina, and ice cream cone strolls days and evenings alike. Ocean beaches are a 7 minute direct drive South from the property. The oak floored open-plan interior of this charmning Beach property boasts open plan red oak floors, a high ceiling Great Room, Swedish antique dining alcove and stainless steel and Italian tile kitchen with large pine cooking and breakfast Island, that all enjoy Panoramic Waterfront views. Beautiful Antique Furnishings are tastefully appointed throughout. The Great Room gives out through double French Doors to the apartment's exclusively private extensive decking, which is furnished with Balinese sculptural furniture, and has European brick grill and night-lit al-fresco dining for 12.The decking spills downwards through 24' wide stairway to a ( if wished) Heated Pool. European shallow grassed steps lead out onto an acre of fruit bearing and flowering waterfront grounds. Off the Great Room on the ground floor there is guest room wing of two small, clean and well appointed guest rooms of one twin bedded and one double, that share a white and blue tiled bathroom with shower and tub with waterfall faucet adored by children and adults alike. There is also a powder room with shower nearby that can be used as second private bathroom for one of the twin guest rooms. The upstairs Master Bedroom Suite occupies the entire 2nd floor and has wrap around water views and a balcony overlooking the entire property and the water. The Master offers California King-sized bed, excellent linens and duvets and huge en-suite Marble Bathroom with large Jacuzzi tub and separate tumbled marble tiled Caribbean shower and separate WC. If available, the 1 bedroom apartment may be rented along with the main house, offering an additional master suite with Queen antique bed, sitting room with antique pine & wicker furniture, bathroom with shower and convenient kitchenette. ***The 3 bedroom Main House rental offers exclusive use of the pool, grounds, decking, kayak, canoe, outdoor shower, outdoor brick grill, use of pond. Our Guests can enjoy a private, gated community with free use of the PRIVATE COMMUNITY'S SANDY BAY BEACHES. It is a 7 minute drive to ocean beaches. Beach Chairs, beach umbrella, cooler and beach towels are all provided. Dining table can be extended to seat 20. Without extension leaves it seats 8 comfortably. Al fresco dining table for 10 outside. Beautiful home, nice owner possible, genuine and helpful. Great location. Recommended! 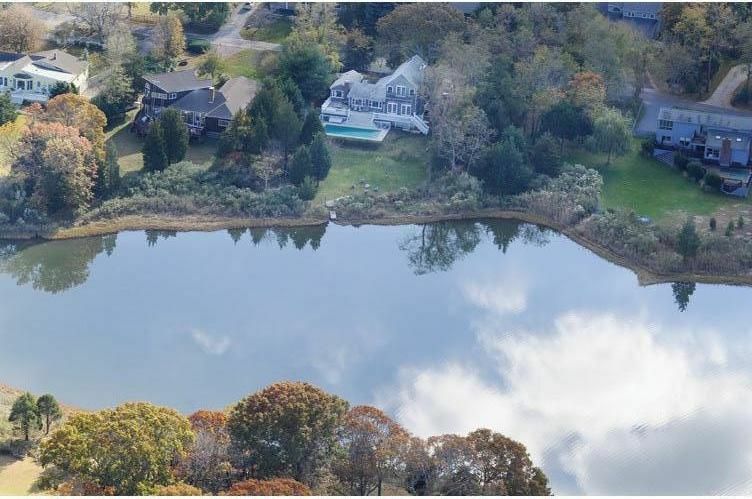 The property is located on a National Reserve pond that gives out to the Peconic Bay and sand beach. Heron, egret, deer, rabbit, fox, and swan as well as many other species can be seen daily. It is peaceful and quiet while remaining a short bike ride or leisurely walk into the charming village of Sag Harbor for restaurants, shopping, marina, and ice cream cone strolls days and evenings alike. Ocean beaches are a 10 minute straight drive from the property.